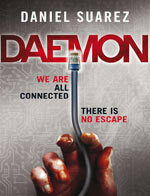 Daemon is the first book by Daniel Suarez, this is the first techno-thriller by Suarez. The novel begins with the death of Matthew Sobol billionaire and legendary computer game designer dies of cancer. His death intiates a Daemon thread, a un-stopable program which reads the online contents and acts accordingly which kills two people the collegues of Sobol. Detective Peter Sebeck uncovers that , there is a program running and it’s has killed two people so far. This Daemon AI program intiates other programs which spread all over the world and starts moving money, recruiting operatives, and even killing. Detective Sebeck and Jon Ross (Colleague of Sobol) try to stop this program. The book is fast-paced, there where no single point in which you feel it’s too slow,If you loved MATRIX and definitly you will love this book. If you know very little about AI, encryption, computer networks and played Games then I am Damn sure you love this book. You will never put it down, a page turner once you start reading. I give it : 5/5.